Bolivia is still one of Latin America’s poorest countries, but its economy has grown rapidly in recent years on the back of high mineral and gas prices, and the government’s pragmatic economic policies. 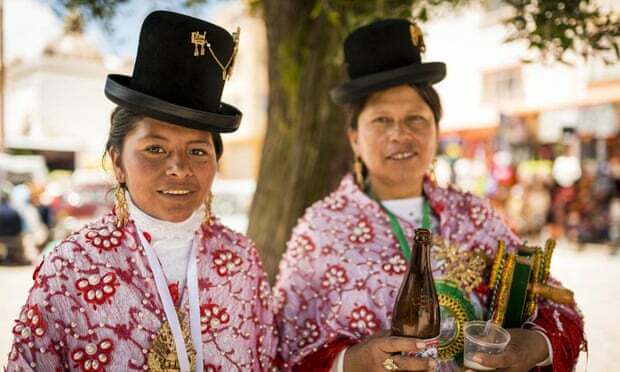 That growth has helped a commercial boom in La Paz and the neighbouring city of El Alto, where Aymara merchants – many of them women – play important and lucrative role. Even the unpracticed eye can see that this fashion is not static. The crowns of the bowler hats that perch atop a cholita’s glossy black braids are getting lower and lower; high crowns now look very last year. “Now people are spending more – people want a whole outfit, from the jewellery to the shoes to the hat,” said Gutierrez. None of that comes cheap: a Borsalino – the most famous brand of bowler hat – costs roughly 300 pounds, and a standard outfit commonly costs another 300. No outfit is complete without earrings and a sparkling brooch to fasten the shawl and another adorning the hat. A fine set may run around 1,400 pounds – but the best can be well over 6,000. 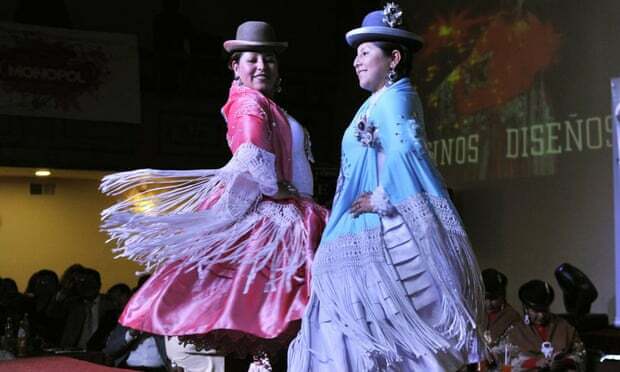 These extraordinary ensembles are shown off at events like weddings, or La Paz’s yearly Gran Poder festival, which brings the cities’ wealthy Aymara merchants out in force. 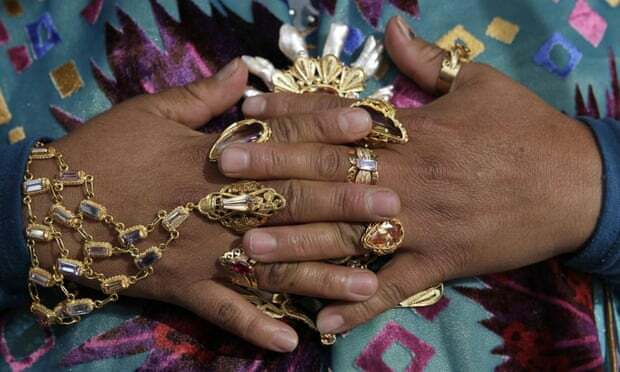 Some of the jewels women wear in Gran Poder are so pricey that they reportedly employ bodyguards follow them throughout the day. This increased visibility is more than an exercise in conspicuous consumption: forced into servitude under colonial rule and later relegated to the margins of society, Bolivia’s many indigenous peoples were long excluded from mainstream society. Until the 1990s, wearing a pollera or a poncho to a government office would have been unthinkable. But attitudes started to change with the election Evo Morales, the country’s first indigenous president who took office in 2006. “Before even recognizing oneself as Aymara was difficult. Really the reverse was happening – because the less Aymara you were, the more social mobility you had. 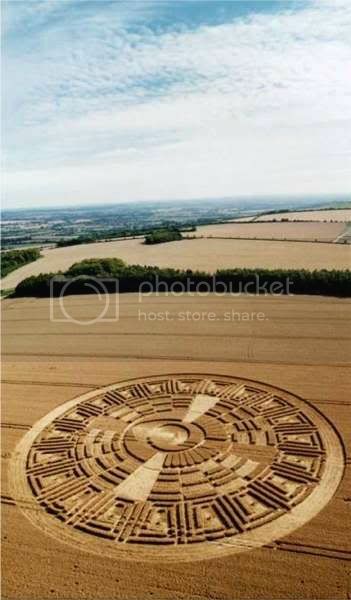 Today it’s very different,” said sociologist Germán Guaygua, who works at the ministry of foreign affairs. Model and TV personality Maria Elena Condori Salgado embodies both the entrepreneurial spirit and ethnic pride of this new Aymara identity. “I’ve worn the pollera since I was very small. My mother wears the pollera, and so did my grandmother,” she said.